The McAllen-Edinburg-Mission Metropolitan Statistical Area (MSA) is located near the bottom tip of Texas. McAllen was the location of the first inland foreign trade zone set up in the United States. Foreign trade zones are locations where foreign goods are brought into the United States tax-free and tariff-free. McAllen’s close proximity to Mexico and the inclusion of Mexico in the ratification of the The North American Free Trade in 1994, provided McAllen’s economy with ample opportunity for growth. The area’s population has increased 36% from 2000 to 2010, ranking it as the 11th fastest growing MSA (1). With this huge growth, McAllen is one of the best cities for recession recovery. The foreign trade zone’s services have recently expanded to include full logistic support services in public warehouse services including pick & pack, order processing, inventory control, incoming/outgoing quality inspection and kitting (2). McAllen’s exports are sizable. During the first half of 2010, McAllen generated over two billion dollars of exports, half of which were from the Computer and Electronic industry. Excluding the fellow NAFTA countries of U.S. and Canada, fully two-thirds of these exports had the APEC region as a destination. Note in the charts below, the 1.494 billion in exports to NAFTA treaty countries is excluded from consideration. It’s all a matter of how you put the numbers together. Maquiladoras are also common in McAllen. A maquiladora is a U.S. or foreign-owned manufacturing facility that processes or assembles components into finished or semi-finished products for export to other countries. With PIERS Prospects we can get a closer view of what is happening on the ground with regard to McAllen’s imports. A simple search leads us to the top industries in the McAllen area. The top imports include motor vehicle parts and household audio and video equipment. Further research finds that Fujitsu Ten Corporation of America is one of the most prominent importers of the region. 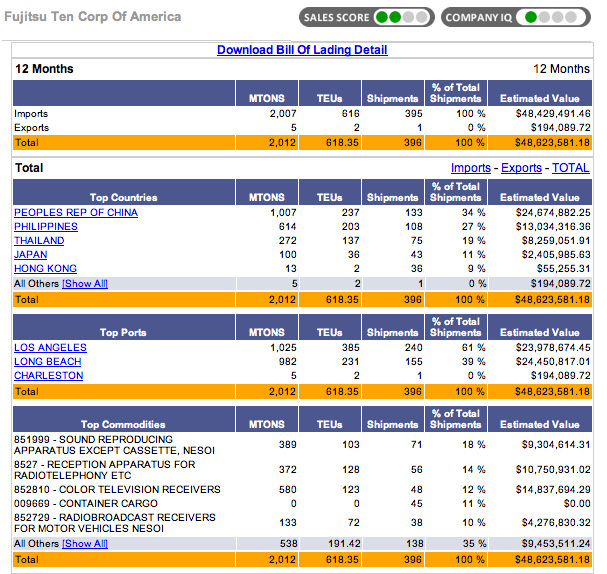 Here we can view Fujitsu Ten Corporations of America’s imports and exports from the McAllen MSA. On the bottom we can see imported product percentage and respective estimated value. You can view and download details on all Fujitsu’s 395 shipments over the last year by downloading the Excel spreadsheet from our World Trade Daily Google Docs site by clicking here. Hello, you used to write magnificent posts, but the last few posts have been kinda lackluster… I miss your tremendous writing. Past several posts are just a little out of track! Saw this headline this morning, perhaps you could share some thoughts on this. Are you hearing similar forecasts from others in the trade community?